Grieving widow or black widow? The day Joan Medford buried her husband was a fateful one—because before the day was out she'd meet the two men who would change her life forever. Forced to take a job waitressing to support herself and her child, Joan finds herself caught between the handsome young schemer whose touch she comes to crave and the wealthy older man whose touch repels her…but who otherwise would make a tempting husband number two. It's a classic Cain triangle —brutal and sexual and stark—that can only end in death. But for whom, the guilty…or the innocent? 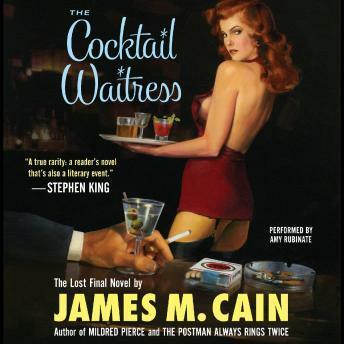 The final novel written by James M. Cain and never before published, The Cocktail Waitress is a testament to the enduring power of one of the most acclaimed novelists of the twentieth century. The author of unforgettable noir classics such as Double Indemnity, Mildred Pierce, and The Postman Always Rings Twice, Cain's work remains as impossible to put down today as when first written, and will leave even jaded modern readers breathless.